Just in time before everyone in America overeats their Thanksgiving fixings, Microsoft has rolled out its Xbox Video service on the web. Holiday feasters stuck on the couch uninterested in football games will be able to log on to the Xbox Video web service at video.xbox.com. 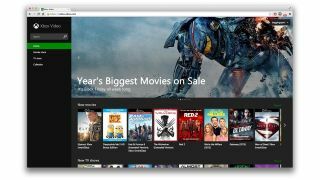 The service provides the same access to TV Shows and Movies as the current Xbox Video app for Windows 8.1 desktops, as well as the Xbox One and Xbox 360. Keeping with its "to the cloud" initiatives, any content bought on one Windows device may be seen on another. The web portal does not add any new features, and instead mirrors what's already available on the Windows 8.1 desktop app as well as Microsoft consoles. Not everything is quite the same though. One crucial feature left out on the web version is HD playback. Content streaming through web browsers with Silverlight will only show up in Standard Definition. Viewers who want to see all the glossy high-definition pixels will have to tune in from a dedicated Xbox Video app on an official Microsoft device. The software maker plans to roll out a Windows Phone version of Xbox Video shortly, however this will also lack HD streaming support. That said, there's still a likely chance that Microsoft will update the website and its future app for high-def. Until then, you can look towards Netflix and Hulu Plus or the à la carte options on Amazon Instant. Sony cracks down on PS4 streaming abuses.